The Green Jay (Cyanocorax yncas) is a bird species of the New World jays, which exhibits distinct regional variations within its large but discontinuous range. The Green Jays of the Northern population are smaller, at 25–29 cm (10–11.5 in), than the South American birds, at 29.5–34.3 cm (11.7–13.6 in). Weight ranges from 66 to 110 grams (2.3–3.9 oz). They have feathers of yellowish-white with blue tips on the top of the head, cheeks and nape, though some taxa have more blue than others. In South American populations, the crown can appear almost entirely white, with less extensive blue. A black bib forms a thick band up to the sides of the head as well as a stripe through the eye line and one above it. The breast and underparts typically are bright to dull yellow, or strongly green-tinged in the far northernmost part of its range. The upper parts are rich green. It has large nasal bristles that form a distinct tuft in some subspecies, but are less developed in others. The color of the iris ranges from dark brownish to bright yellow depending on the subspecies. The American Goldfinch (Carduelis tristis), also known as the Eastern Goldfinch, is a small North American bird in the finch family. It is migratory, ranging from mid-Alberta to North Carolina during the breeding season, and from just south of the Canadian border to Mexico during the winter. The only finch in its subfamily that undergoes a complete molt, the American Goldfinch displays sexual dimorphism in its coloration; the male is a vibrant yellow in the summer and an olive color during the winter months, while the female is a dull yellow-brown shade which brightens only slightly during the summer. The male displays brightly colored plumage during the breeding season to attract a mate. The American Goldfinch is a granivore and adapted for the consumption of seedheads, with a conical beak to remove the seeds and agile feet to grip the stems of seedheads while feeding. 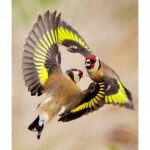 It is a social bird, and will gather in large flocks while feeding and migrating. It may behave territorially during nest construction, but this aggression is short-lived. Its breeding season is tied to the peak of food supply, beginning in late July, which is relatively late in the year for a finch. This species is generallymonogamous, and produces one brood each year. Human activity has generally benefited the American Goldfinch. It is often found in residential areas, attracted to bird feeders which increase its survival rate in these areas. Deforestation also creates open meadow areas which are its preferred habitat.